Although considered common, seeing blood when you brush your teeth is far from normal, and can be a significant indicator that you need to visit your dentist. The beginning stages of gum disease often go unnoticed by the sufferer, and can quickly progress into a serious ailment requiring extensive restorations. Regular dental visits are the best way to monitor for disease, and quickly treat any problems as soon as they occur. Postponing your preventive visits for even a few months can equal disastrous results for people prone to gum infections. Gingivitis is the only reversible stage. Periodontitis is an advanced stage of gum disease that can cause permanent problems. Gum disease is always painful. Bad food is what causes infection under your gums. TRUE – Gum disease progresses quickly, and it begins with gingivitis, or inflammation of your gum tissue. This is the only reversible stage, and usually requires your dentist’s intervention to help your gums return to a healthy state. If gingivitis is ignored and allowed to progress, there is no cure, and you will have to practice good maintenance to keep your oral structures from deteriorating over time. 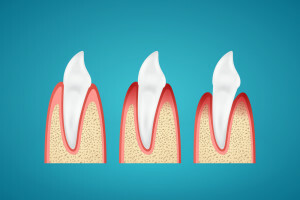 TRUE- Periodontitis is the final, most advanced stage of the disease, and can be extremely painful. Once the infection has reached this point, you are likely to have incurred damage to the supporting structures that hold your teeth in place, as well as possible bone and tooth loss. Some patients require surgical correction to ease their discomfort. FALSE – In the early stages of gum disease, you may be absolutely unaware that anything is wrong. In fact, many cases go undetected for quite a while because regular dental appointments are not maintained. Your dentist plays an integral role in catching and treating gingivitis before it is too late. FALSE – The main cause of gingival infections is bacteria and plaque accumulation just below your gum line, which releases toxins and erodes your periodontal tissues. Over time, this can cause your gums to separate from your teeth, creating periodontal pockets, and severe complications.